If your little girl was anything like the rest of us around the world, she instantly fell in love with Emma Watson as Belle in Disney's long awaited live action adaptation of Beauty and the Beast. And what's not to love? This delightful update finally let us see the "odd" heroine as the events of the story transpire with a new kind of realism. And of course, one of the most interesting aspects of translating the story to live action was getting to see the costumes come to life. We first meet Belle wearing her village outfit, and no sir, she's not wearing any princess duds. The threads she's wearing are designed for everyday "provincial life!" 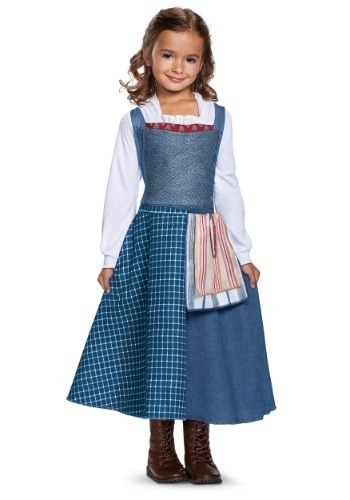 This costume captures that movie look in an easy and fun costume choice for girls. The classic blue dress is created with contrasting patterns, and an attached white blouse captures her movie appearance.Two detachable tea towels on the waist and some red bodice trim add a splash of color, and the entire assemblage looks like the self-crafted and homespun gear Belle would most definitely wear. This costume is Disney officially licensed, and ready to help your girl bring her favorite fairytale to life. We're sure there's not going to be a single thing odd about her when she gets this terrific girl's Belle costume!